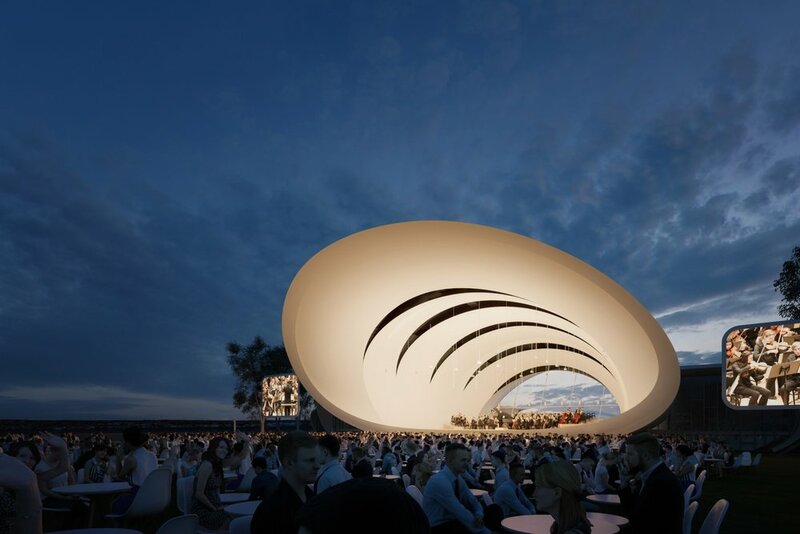 The San Diego Symphony Orchestra has appointed Soundforms to design a bespoke Performance Shell, with their architects Flanagan Lawrence, to be permanently installed as the open-air stage for its new San Diego Symphony Bayside Performance Park. The Soundforms Performance Shell for San Diego is a scaled up version of the product used on the London 2012 Olympic Park. The stage will accommodate an orchestra size of up to a 150 musicians and choir, with a front of stage width of 32M, a depth of 20M. The roof cantilevers 15M from the front of the stage and can carry a payload of up to 50T. The stage will incorporate a state-of-the-art ‘Constellation’ sound system, designed and engineered by Meyer Sound. This system will provide an exemplary sound environment on stage for the musicians of the San Diego Symphony Orchestra, whilst also providing the technical flexibility required for a variety of other performances, including Pop, Jazz and Film. Soundforms is a UK based consortium that was founded by Mark Stephenson (Classical Musician and Conductor). The consortium includes Flanagan Lawrence (Architects), ES Global (Staging Company & Project Manager), Expedition (Structural Engineers) and Harrison Parrott (Classical Music Agency). The Soundforms team is working in conjunction with Tucker Sadler (Lead Architect and Architect of Record), who are responsible for the overall design of the new San Diego Symphony Bayside Performance Park, Charles M Salter (Project Acousticians), Shaun Murphy (Sound Consultant), Meyer Sound (Designer of the Constellation Sound System), Shuler Shook (Theatre Consultants), Coffman Engineers (Client’s structural engineers), Burton Studios (Landscape Architect)and Gardiner Theobold is working as the client’s Project Manager. “I believe you’ve come up with a world-class project, something San Diegans will benefit from for many, many generations”, says Dan Malcolm, Port Authority Chairman (2016).